Here's the lowdown on Africa 2018! 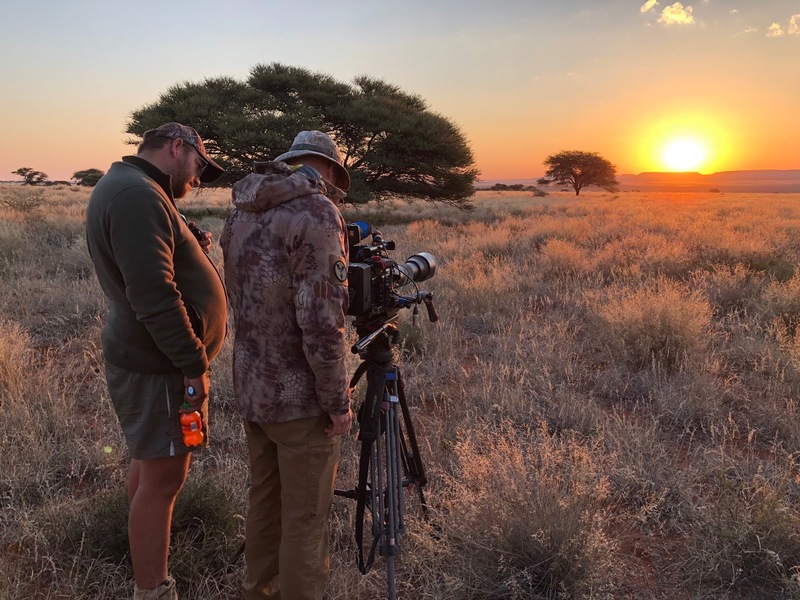 We were hunting at Ft. Richmond Safaris about an hour and a half from Kimberly, with Richard's and my very good friend Geoffrey Wayland doing the PH duty. The property we were hunting on was roughly 10,000 acres, with hills, acacia savannas and thorn thickets that proved to be a lot denser when you were stalking through it than it looked from the hilltops. We filmed the whole hunt for SHOOTING GALLERY 2019...Director of Photography Brook Aiken and his assistant, Bat Mann (yeah, he gets it!) did an amazing job of capturing everything on video. I think you guys are going to be really surprised at how this looks compared to an "average" hunting show. Here's the whys and wherefores...last year Richard Mann's and my Scout Rifler Safari was a huge success...for hunting...for television...for Richard's continuing research on the efficacy of a Scout Rifle as a utility tool.A minor thing I wanted to throw in here....both Richard and I have and shoot numerous AR-platform guns, and we really like them. Richard was once asked by Another Really Famous Gunwriter to name one thing...ONE SINGLE THING...that a bolt gun could do that an AR couldn't. Richard's response was simple, "You can take a bolt gun to Africa." Sadly. the rest of the world is not nearly so accepting of semi autos and the United States. As the Scout Rifle Safari was wrapping up, Richard and I started thinking about "what next." 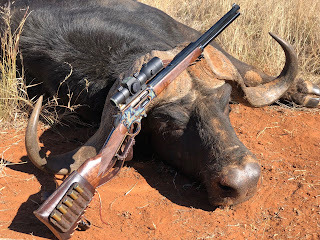 Both of us are fans of the lever action rifle, and we pretty much spontaneously said, "Cape Buffalo with a lever 45-70." As soon as we got home, I contacted Carlos Martinez at the Remington Custom Center. We've featured the Custom Center on SHOOTING GALLERY before, and Carlos was on the show I think in Season 2 (long before he thought of going to work in the gun business) shooting IDPA, and he's been on numerous times since. So we started putting together the Lever Rifle Safari, based around the Marlin 1895 45-70. Richard used a Marlin Custom Center "Modern Hunter;" Carlos a 24-inch Custom Shop version with a peep sight. My gun, as you know, is a one-off custom Worked out with Carlos at the SHOT Show this year — a 16-inch barreled Cowboy version fitted with Skinner Express peep sights, with the intent of using an optic mounted to that sight rail. 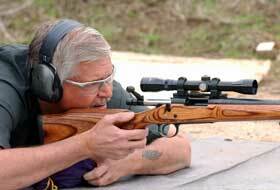 I've talked a lot about this little carbine, because it is simply one of the best-handling rifles I've ever shot. Five 45-70s in the tube plus the one in the chamber, which is impressive firepower in a short, light package. It is the best "stalking rifle" I have ever owned. 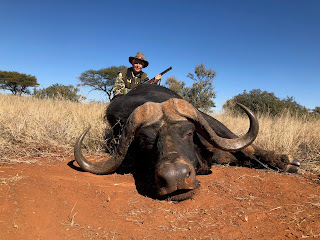 All of us — Richard, Carlos and I — took the Cape Buffalo hunt seriously...I think I've covered a lot of my training on Facebook. I did a lot of shooting with my Wild West Guns Marlin 1894 .44 Magnum, which also went to Africa with me, using .44 Magnum 240-gr Fiocchis. With the 1895, I trained with mostly Winchester 300-gr 45-70s, with Buffalo Bore dinosaur killers throw in as well. I also spent time on my "woods walk" course — which I designed after my first trip to Africa — with a Henry .22, working on positional shooting. Mostly I trained off sticks and offhand. The ammo choice was obvious, Buffalo Bore 430-gr 45-70 "Magnums," at a little over 1800 fps out of the short 16-inch barrel. The 430-grainers comer recommended by Tim Sundles at BB, Max Prasac and Richard Mann, and they delivered. This round from the 1895 is one of the hardest-recoiling rounds I have ever put to my shoulder...if you decide to use this round, don't say I didn't warn you! Before the trip I religiously studied Kevin Robertson's PERFECT SHOT AFRICAN EDITION, plus I read (or reread) Craig Boddington's BUFFALO!, AN AFRICAN HUNTERS GUIDE TO NYATI, and, of course, John Burger's 1947 epic HORNED DEATH...LOL! I discussed the hunt beforehand with both Craig and Larry Potterfield, and they were enormously helpful. As an aside, earlier I'd taken a pretty big warthog with the Marlin Wild West .44 Magnum, with a 197-yard shot using DoubleTap's 300-gr Nosler JHPs. I held over a few inches at that distance, and he ran a bit. The dot on the .44 is a Trijicon MRO. In terms of gear, it's all pretty straightforward...the VERSACARRY Velco'ed ammo holder that Richard helped create worked extremely well. Easy to go from the belt to the gun. I used a set of lightweight Steiner binocs...not nearly as good as my Lucids, but about half the weight, and I got caught out on weight while I was packing. I carried my usual Leupold rangefinder and a Tim Wegener-designed folding hunting knife. Richard and I went over the buffalo hunt very carefully with Geoffrey. Geoff's policy is that he doesn't shoot unless it has all gone to hell. "It's your hunt," he said. "You do the shooting, not me. I won't shoot unless it has gone very very badly." Which, of course, was our preference as well. Geoffrey backed me up with a Dakota 375 H&H bolt gun. On the hunt itself, I am at a loss to understand how something the size of a friggin' Prius can just disappear into the thorn! We did 13 stalks over 2 days, about half of them in dense thorns, total of about 12-13 miles of hiking. We probably saw him on 5 or 6 of those stalks, but we either lost him in the bush, the wind was against us or he just refused to go where we thought he would go. We ran him up on one stalk at about 5 yards, just the other side of a big thorn bush....a pucker-inducing event, BTW. He snorted, and his huge boss appeared above the thorn. Both Geoffrey and I got our guns up and probably could have gotten off a shot, but at 5 yards it would have been a moot point if the buffalo had decided to charge. Instead, he snorted again, turned and took off. Eventually, our heart rates got back to normal, and, to my credit, I didn't wet myself. The final stalk was in the thorn, as, hell, it probably should have been. The buffalo had backed into the densest underbrush and was facing us dead on at about 60 yard. And yes, we'd been pushing him hard and he was pissed off snorting. I fired a total of 4 shots. First shot was head-on left side lungs, upper heart. He went to his knees, and, as I h ad read in the books and had been warned by Geoffrey, in the case of a lungs/heart shot, the buffalo came out of the brush bucking and roaring. Second shot, within seconds, was the one Geoffrey and I were looking for, the point where the neck meets the spine. That shot literally knocked the buffalo off his feet. 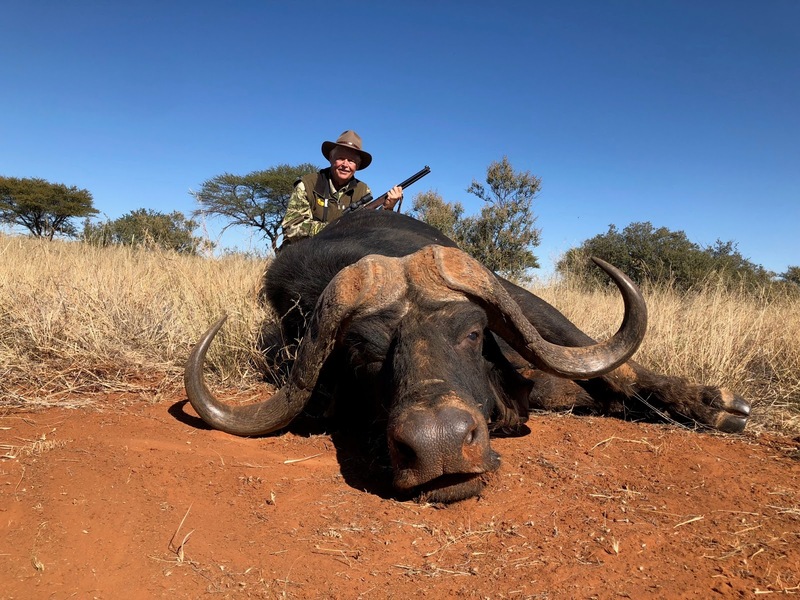 Geoff solidly held me back, as Mr. Stupid's immediate response was to close and finish it...a surefire recipe for getting a horn in the gut, as "dead" buffalos can and have killed people. The buffalo, as Geoffrey predicted, bellowed and, amazingly, came up a third time. Geoffrey instructed me to put the third shot directly through his shoulders, which I did, and he went down for the count. Fourth shot was an anchor, again through the heart, before we approached the downed bull. I would not have had the hunt any other way. It was hard, scary and exhausting. My shots were all good. 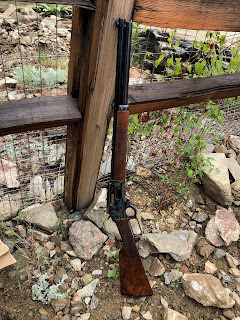 The Marlin performed perfectly, and in the video you'll see how quickly I was able to deliver the second shot with the lever action...that's what a decade of Cowboy Action Shooting will do for you! I partially short-stroked the gun between shots 2 and 3, but because I had PRACTICED dealing with a short-stroke, it was no big deal. This was the hunt of my life. The buffalo was old, much scarred from his battles, smart and dangerous, a beast that never in his long life knew fear. In truth, I am at a loss to explain the melancholia that descended on me after the aging warrior fell. Far greater talents than me have tried to explain hunting in a way than can bridge the gap between those who hunt and those who don't, and they have failed. Suffice to say that I have chosen to be a part of this world. I am not a spectator; I acknowledge that I bring death, but I do so in the sure and certain knowledge that the Great Hunter will come for us all, in His own time. Meanwhile, on the high veldt, life goes on. Thanks for sharing. You tell the story well and hostesty . Many of us will never get to Go on an African hunt but you give us a taste. It brings great pride to have Gunsite people living the hunters life. Well done, Sirs. Congratulations Michael. It sounds like a magical hunt. Hope you let us see the video at some point on DRTV! Congratulations on a successful hunt and thanks for the great story. Great pictures. 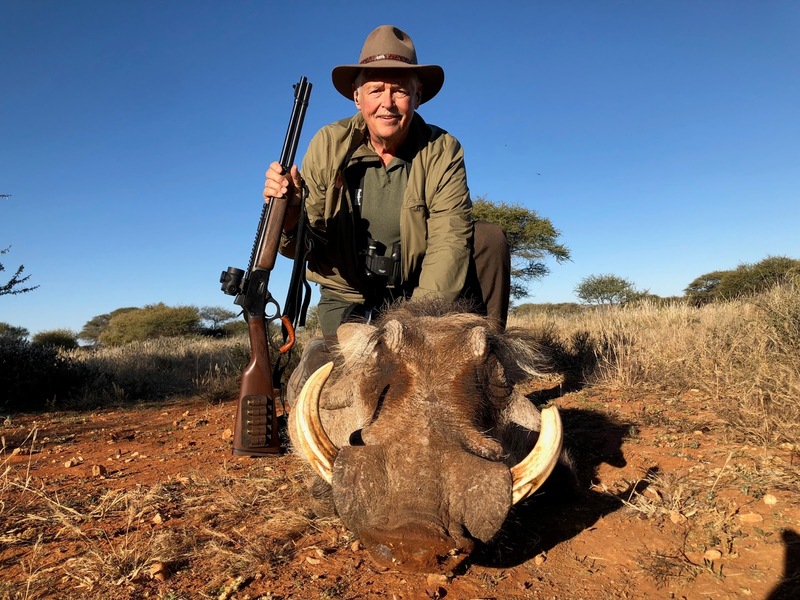 I had the good fortune of visiting Africa once on active duty and have wanted to go back on a Buffalo hunt ever since. Its on my to-do list. You've described the hunt very well. More pictures! Well done that man. Hope to go back to Zambia for Nyati in the next couple years. Will read your referenced documents on shot placement. I am moved by your words, Michael. A trip of a lifetime described by a poet. Thank you, very much. Let me be the first to say...Dilly Dilly ! Great post....proud to know you . Very well done. Thank you for sharing. Really a very useful article. Can I help you ? A great hunt; Col. Cooper would be proud! What a thrill. Listened to your podcast this morning. Was surprised it dropped a day early, but happy to listen to you on my daily walk. Happy that is until the end of the podcast. The melancholia expressed at the end of the dugga boy's life journey surprised me to say the least. I sat down and halted my walk to listen to you. I snapped back 50 years ago when I shot my first deer. It too had a profound impact on me. BUT...when I got home after field dressing it alone and dragging it for miles in the snow I thunk about it. Over the coming weeks I realized that we all, as Hemingway might say, are in the bull ring. As our time comes to a close what better way to go than to have a worthy opponent battle with us. If we win so be it. If we lose, well we go out in glory. As you said, no wooping or hollering. But rather respect. Remember all the hunting society rituals after the kill. The twig in the mouth. The prayer. Carrying the leopard back on your shoulders to honor him. Joseph Campbell spoke of the power of the ritual. When we read about the Alamo it stirs our hearts and spirit. When we read of the Samurai fight on Ganryu island again it stirs us. 300 Spartans...same. My personal favorite, the Finn American early Green Beret Larry Thorne and his( life story brings me to tears. All warriors who lived a storied life and at the end died with honor. I realized young that we all move on to next plane. We all will. This life is all about how we live this life. Even that dugga boy. As an old bull he lived the dugga boy life to the max. He didn't shy away from danger, he battled in his years on the veldt and won. When he faced the last, he did so on his feet. And then to quote the Son... "It is finished". I hope it won't be your last safari. After a couple of million years of evolution on that same sacred ground, we can not deny what we are. We are part of this beautiful mosaic. I suspect our time on this planet is going to be limited. But we all have our place and role. You and that old bull provided one glorious celebration of life. 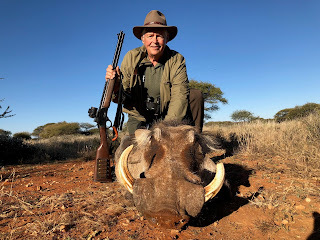 I think that in telling this tale of your hunt of a lifetime to take a mighty Cape Buffalo, you have touched many of your followers in a lot of ways, from the equipment you used, to the tales of how you took the animals, to the wonderful friends you were able to spend time with on the trip. But what seems to have reached into most people's hearts is the identification with your sense of melancholy at the taking of this great warrior, though a fitting end for a life certainly well lived. Whether it is a simple rabbit or squirrel, or a Michigan Whitetail deer, it seems that the older I get, the more I myself identify with that same sense that you felt. I have come to respect the spirit of the animals much more now as a more mature person than as a young pup. I think that maturity comes about in a man, or woman, when they are able to recognize their place in the universe, and realize that it is both insignificant, but also can be of lasting importance, if you live a life worth living. Part of that includes how you fit in with all of the rest of God's creation. Thank you for one of your best tales of your adventures. May you live long and enjoy many, many more. An absolutely wonderful write-up. You do yourself, and all hunters, proud. Great post. 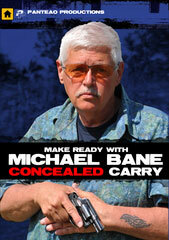 Something you need to chronicle in Gun's and Ammo for a lowdown on that choice 45-70. And, take your pick, put the hunting saga into one of the Big Three or Peterson's Hunting! A successful hunt, or even a not so successful hunt, involves a very intimate relationship. It is a relationship based not on love or hate or greed. It should not be based on pride. It is based on shared mortality. We know that we will also someday end up just as dead as the animals we hunt. It is the only honest and equal relationship one can have with a wild animal. Taking a picture is a casual and distant relationship to the animal, at best. Capturing an animal and putting it in a cage takes away most of its wildness. Tame it and it becomes something else, no longer wild or free. Hunters have long acknowledged the respect that is owed to the prey. Many rituals have been adopted in different cultures to express this respect and thank the prey animals for their sacrifice. As hunters, we are privileged to share in the ongoing pageant of life in a more elemental way than someone whose only connection to the natural world is a plastic wrapped steak at the grocery store or a video in TV. I acknowledged examining your blog. I have scrutinized your blog extraordinary information on this blog. I esteemed understanding it and I figure people will get a lot of totally supported from this (McAfee.com/Activate) blog. Sam, I have made this deal with of blog. I have you like this blog, because of examining for this blog. It includes the system pre-requirements to active the security program, How to locate the install program and how to utilize it once you have it. Get my latest posts sent to your PC, Blackberry or iPhone! Hog On Ice...2 big ole thumbs up! Lead Dispencer's site — WAY Cool Stuff! MY SHOWS! If you"re not watching "em, your life is worthless...WORTHLESS, I tell you! SHOOTING GALLERY...the hands-down best gun show on television! COWBOYS!...are you gonna jerk that smokewagon or just stand there and bleed? Show Sponsors — God Bless "Em!